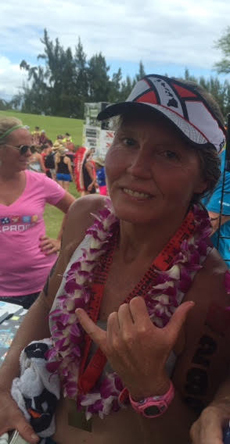 Celeste St.Pierre Celeste is a Master Total ImmersionTM Coach, as well as a triathlete with over 20 years of experience in Sprint, Olympic, off-road, half and Ironman races, including the Great Floridian 1998, Ironman Florida 2000, and Triathlon All-American 2004. She was third in her age group in 2011 at the Nationals Sprint Tri and was Regional Champion in 2011 for Off-Road triathlon. She is a certified Power Pilates Instructor, a USA Swimming Level 1 Coach, and a USA Triathlon Coach. 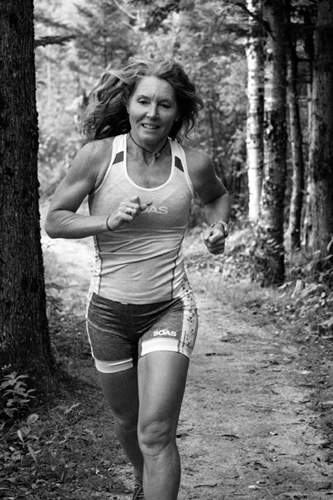 She lives and trains in the White Mountains of New Hampshire. Click HERE to listen to (or download) the audio interview! Above everything I want to be healthy and I want you to be healthy right along with me. So, I’m here to share with you what I know from my personal experience. I have come to learn to trust my own body’s infinite knowing to lead me to my perfect health. I am here to tell you if I can do you it…so can you! I was not always healthy though. I had my share of struggles with my own weight in my younger days, trying diets with no success. Over the years though, the more I listened to my body, my health improved. Using this approach I became a very healthy person with no more weight fluctuations. By eating more wholesome foods, actually eating meals, no skipping, no bingeing, but listening to my bodies cravings, I fed my body what I needed. The results, I had more energy, a more positive attitude, my acne cleared up and I lost weight. Imagine that I lost weight by eating! My weight leveled off and stopped dramatically fluctuating. By turning my nose up at the latest fad diet, shutting down all the external noise of advertisements, commercials, the latest research, etc and instead going internal to my own bodies ability to show me the way, I healed myself both physically and mentally. By mentally healing myself I mean it was difficult to eat and not feel guilty. But, once I realized there were more calories in the guilt I had around food as well as “bad” food, the easier caring for myself became. This brought to my attention there can be an emotional side to eating. I noticed when I felt anxious I would reach for food, usually food that was sugary, poor quality ingredients, processed and full of chemicals. It alleviated the stress for a very brief moment, but in the long run I felt even worse! I felt awful mentally and physically from eating crappy food and I still felt anxious about the work I had yet still to do. Craziness! But I kept at it, reaching and seeking and listening to the messages my body was sending out. I felt it important to listen now, not ignore if I wanted to truly be healthy. Here I am today, healthy, happy and fit! I am so glad you found my site so I can share with you what I know from what I learned about nourishing my body in ways that satisfy me. I want to support you. I want you to listen, to hear your inner voice and let it guide you. Through your bodies infinite knowledge to heal, it will lead you to your perfect health. It’s easier than you think to embrace the healthy, active, energetic, happy life you are meant to live! Love what you do…Love who you are! I earned my BA degree in Psychology at Plymouth State University. I love the power of the mind and what we can do with our thoughts. My belief is we, humans, can literally make ourselves sick, but we can also make ourselves well with the power of our thoughts. How cool is that! We can use the power of our thoughts and feelings to have a great experience or not, it’s up to us! I love this picture of me back in 1990 when I was in my “caterpillar” stage of life. This picture is more than 20 years later in November, 2012. I am just about to reach my “butterfly” stage of life. 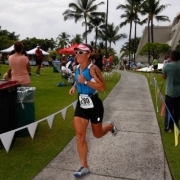 Here I am happily finishing an Olympic Distance Triathlon on the Big Island of Hawaii in Keauhou. Contact me to learn more about my amazing transformation. Here are some suggested readings that I think you’ll enjoy as much as I have!